As regular readers know, I’ve begun posting my end-of-year “The Best….” lists. There are over 1,700 regularly updated lists now. You can see them all here. You might also want to check out All Mid-Year 2017 “Best” Lists In One Place. Some sites I’m including this year are primarily geared towards teachers creating content for classroom use, but could also easily be used by students. It’s possible that a few of these sites began earlier than this year, but, if so, I’m including them in this list because they were “new to me” in 2017. Instead of ranking each of the tools on this list in order, I have them organized into three general groups: Useful, Good, and Excellent. The “Excellent” tools are added to the “All-Time” list mentioned previously. Get Acquainted is a very intriguing online survey tool that creates “conversational polls.” I’d encourage you to read Richard Byrne’s post and watch his video about it. I’m adding it to The Best Sites For Creating Online Polls & Surveys. Bamboozle lets you create games your class can play by projecting them on a screen. They seem easy to create, though I it doesn’t yet have that large of a collection of ones that other teachers have created. You might also be interested in The Best Websites For Creating Online Learning Games. Stitcht lets many people upload videos from a similar event to one place and puts them all together. I’m adding it to The Best Web Applications That Lets Multiple People Upload Their Photos To One Place. Shabaam lets you record audio to accompany a huge selection of GIFs. It could be a good tool for ELL speaking practice. I’m adding it to The Best Sites To Practice Speaking English. Queeky is a free online drawing tool. I particularly like their MultiDraw feature, which lets you create private virtual rooms where users can collaborate in drawing. I’m adding it to The Best Art Websites For Learning English and to The Best Online Tools For Real-Time Collaboration. Taleship is a new simple site designed to promote “slow” collaborative writing. You write something, and then you invite a new person to continue the story. I’m adding it to The Best Sites For Collaborative Storytelling. Time.Graphics looks like an easy (and free) online tool for creating timelines. It takes seconds to register, and it has a sophisticated, yet simple, interface, and you can easily add multi-media features. I’m adding it to The Best Tools For Making Online Timelines. SlideBot lets you type the text you want to appear in each slide and then uses its software to design your slideshow in seconds. It’s pretty neat, and they’ve just unveiled a free education version. Unfortunately, if you want to be able to export it or use it in full-screen mode, it will cost $15. Those restrictions might make its use in education somewhat limited. However, I could also see some pretty major advantages, including eliminating the extensive time that some students spend on slide design. In addition, having students use SlideBot even a few times could be a good learning experience about good design of slides – its software appears pretty powerful based on my testing it out. I’m going to purchase the $15 dollar license for myself because it seems to create slideshows that are a hell of a lot better looking than the ones I create manually. In many ways, it’s a non-animated version of “My Simple Slideshow,” which automatically creates animations from text (see Wow – “My Simple Show” Is An Extraordinary Tool For Creating Free Video “Explainers”). I’m adding this info to The Best Ways To Create Online Slideshows. Verse lets you create interactive videos. I’m adding it to A Potpourri Of The Best & Most Useful Video Sites. Story Friend is a new iPhone app that may have potential. It lets you create slideshows (like a zillion other apps). However, this one lets you include content from other social media accounts, too – sort of a like a mobile Storify tool. Dotstorming is an online collaborative tool that allows groups to work together and vote on preferences. It’s like a bunch of other similar tools, though this one stands out because it lets you easily search for and post images. I’m adding it to The Best Online Tools For Real-Time Collaboration. PortfolioGen lets students easily create online portfolios of their work. I’m adding it to The Best Resources For Developing Student Portfolios. Anchor is an easy tool for creating podcasts. You can read more about it at Richard Byrne’s blog. I’m adding it to The Best Sites To Practice Speaking English. QuizPedia lets you – or students – easily create…quizzes. You can learn more about it from Ed Tech For Beginners. I’m adding it to The Best Ways To Create Online Tests. Sketchboard is an online whiteboard where users can draw collaboratively. I’m adding it to The Best Online Tools For Real-Time Collaboration. Chart Accent lets you create charts and then annotate them. Thanks to Flowing Data for the tip. Pinup is the latest addition to The Best Online Virtual “Corkboards” (or “Bulletin Boards”). Recap is a new tool designed to have students create short videos highlighting their reflections on the learning they’re doing in the classroom. I’m adding it to A Potpourri Of The Best & Most Useful Video Sites. StepMap looks like a decent map-making site. I’m adding it to The Best Map-Making Sites On The Web. Animaker looks like a pretty simple tool for creating online animations. It has lots of premium features, but you can make five for free. I’m adding it to The Best Ways For Students To Create Online Animations. Telegra.ph lets your create a webpage without having to register. You can read more about it at Richard Byrne’s blog. It’s similar to a number of other sites, including Loose Leaves, Just Paste It, and Instablogg. Web Whiteboard is a nice online collaborative..whiteboard. You can read more details at Richard Byrne’s blog. I’m adding it to The Best Online Tools For Real-Time Collaboration. Flipanim lets users easily create short animations. I’m adding it to The Best Ways For Students To Create Online Animations. The Keep Calm-O-Matic is another site that lets you create visually engaging quotations to share online. I’m adding it to The Best Tools For Creating Visually Attractive Quotations For Online Sharing. Mozilla sponsors its own free, online collaborative whiteboard space. I’m adding it to The Best Online Tools For Real-Time Collaboration. I Heart Venn Diagrams lets you make…Venn Diagrams. I’m adding it to Not “The Best,” But “A List” Of Mindmapping, Flow Chart Tools, & Graphic Organizers. You can easily create simple email newsletters with elink. I’m adding it to The Best Applications For Creating Free Email Newsletters. Raw Shorts lets you easily create…short videos. I’m adding it to A Potpourri Of The Best & Most Useful Video Sites and The Best Resources For Creating Infographics. Muro is a simple online drawing tool. I’m adding it to The Best Art Websites For Learning English. Culture Street lets you make and save comic strips online. I’m adding it to The Best Ways To Make Comic Strips Online. Edji lets you upload any text and have readers annotate it with comments. You can make all the comments public to readers, or keep them private. Thanks to Shelly Terrell for the tip. Even though it only works with text and not websites, I’m still adding it to The Best Applications For Annotating Websites. Prism also lets you just annotate text to upload, but in a very dynamic way. Add Text lets you easily…add quotations on top of photos. I’m adding it to The Best Tools For Creating Visually Attractive Quotations For Online Sharing. You can quickly and easily create online bar charts with Chartico. I’m adding it to The Best Tools To Make Simple Graphs Online. By the way, I just updated and revised that list. Tolks is a great tool that lets you create animated dialogues. In many ways, it’s similar to the Google Docs Story Builder, which I was disappointed to see appears to have been shut down. The main problem with Tolks is that you can only use it if you register with Twitter or Facebook, which isn’t going to work with students in schools with Internet content filters. Slatebox appears to have a lot of bells and whistles. However, the feature I like most is its ability to easily search, label, describe and connect photos. That capability makes it a great tool for students to create picture data sets. Plus, no registration is required. I’m adding it to The Best Online Virtual “Corkboards” (or “Bulletin Boards”). Thanks to Donna Baumbach for the tip. Quiznetic is a Kahoot-like tool that lets you create learning games in various racing forms. Students can then “race” each other in answering the questions and see their positions. It appears to be free, and seems simple to use. Google unveiled AutoDraw, a free site that uses artificial intelligence that provides a series of guesses about what you are drawing. You can choose the right “guess” to pretty-up your artistic creation, write up some description, and then download it or share the link. This is perfect for English Language Learners – instead of spending tons of time getting their drawing “just right,” they can, instead, have fun drawing quickly and spend more time on the language part of the exercise. And it’s great for ESL teachers, too – no more working hard trying to draw images of scenes for vocabulary items to support language acquisition. Now just draw a few lines, project it onto the screen, and you’ll be able to show a masterpiece. I’m adding this info to The Best Art Websites For Learning English. Apple released a neat new free app called Clips. You can read a very good – and detailed – explanation of its features at TechCrunch. It’s billed as a video-editing tool, and it seems like an excellent and simple one. I’m always on the look-out for one of those since I have my IB Theory of Knowledge students periodically make videos, so Clips definitely gets added to the Not The “Best,” But A List… Of Online Video Editors list. But it’s much more than just a video-editor. It has the “stop-action” ability of Instagram video (press to video, stop, press again), it provides flowing text you want to display by recognizing the words you say (a particularly useful tool for English Language Learners) and, even though it’s an Apple product, it’s easy to share videos to whatever platform you want to use. So, because of those features and others, I’m also adding it to The Best Resources For Learning To Use The Video Apps “Vine” & Instagram. StoryShares lets teachers create virtual classrooms for free and offers a collection of books that students can read. Even better, there’s an option that provides audio of the text in a pleasing-to-the-ear-voice. The best part of the site, though, is that students can also write and publish their own books to share. I’m adding it to The Best Sites Where Students Can Work Independently & Let Teachers Check On Progress. Google Sites opened its new version to the public for creating websites.You can read all about it at TechCrunch. I’m adding it to The Best Ways For Students Or Teachers To Create A Website. Annotator Tool is an easy and accessible feature from the Maryland Public Television’s Thinkport. All a teacher has to do is create a name for the project and a password, copy and paste any text, provide instructions for annotation and – voila – you’re done. Students then go to the Annotator Tool site, type in the name of the project, register, and do all the required annotations. The next time the teacher sings-in, he/she will see all the student submissions and comment on them, which students can access. It really can’t get more simple. The only question I have is wondering how long bot the teacher and student work is saved on the site. I’m adding it to The Best Applications For Annotating Websites. The Book Creator app has been enormously popular in the classroom where students have iPads – it’s super easy for students to create…books and that’s why it’s been on the The Best Resources For Beginning iPad Users list. It has now come to the Web when using the Chrome browser!I’m adding this info to: The Best Sites That Students Can Use Independently And Let Teachers Check On Progress and The Best Places Where Students Can Write Online. 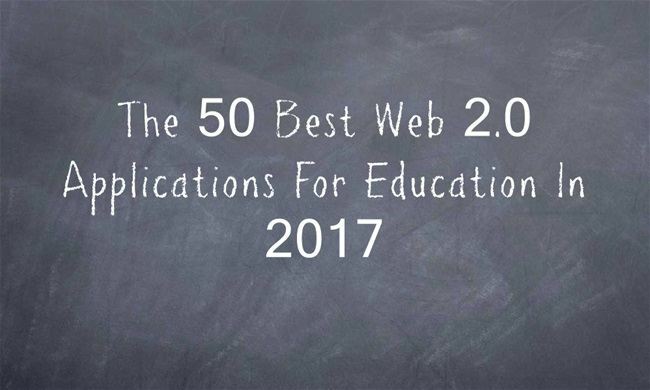 Unfortunately, this was the first year that no new Web 2.0 application made it into this category.